Other Notes: Collaboration Series. Hoppy Belgian-style ale. 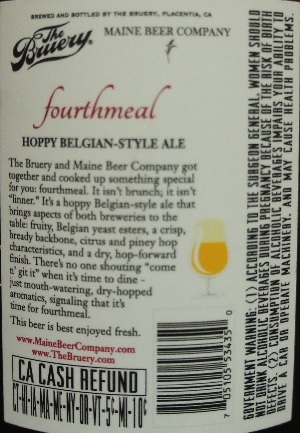 Brewer Description: (from bottle) The Bruery and Maine Beer Company got together and cooked up something special for you: fourthmeal. It isn’t brunch; it isn’t “linner.” It’s a hoppy Belgian-style ale that brings aspects of both breweries to the table: fruity, Belgian yeast esters, a crisp, bready backbone, citrus and piney hop characteristics, and a dry, hop-forward finish. There’s no one shouting “come n’ git it” when it’s time to dine – just mouth-watering, dry-hopped aromatics, signalling that it’s time for fourthmeal. This beer is best enjoyed fresh. 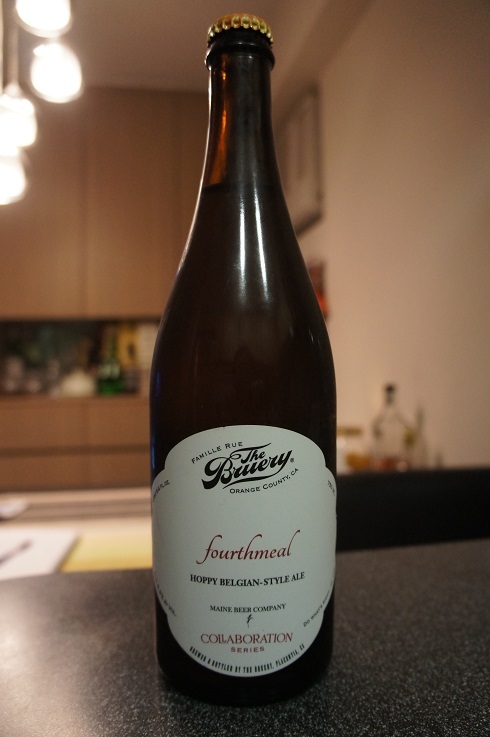 Intro: A 750ml bottle from batch #280, bottled on 9th December 2015 and poured into an oversized wine glass. Appearance: It poured a hazy golden orange colour with a one finger slightly off white head with decent retention and very nice lacing. 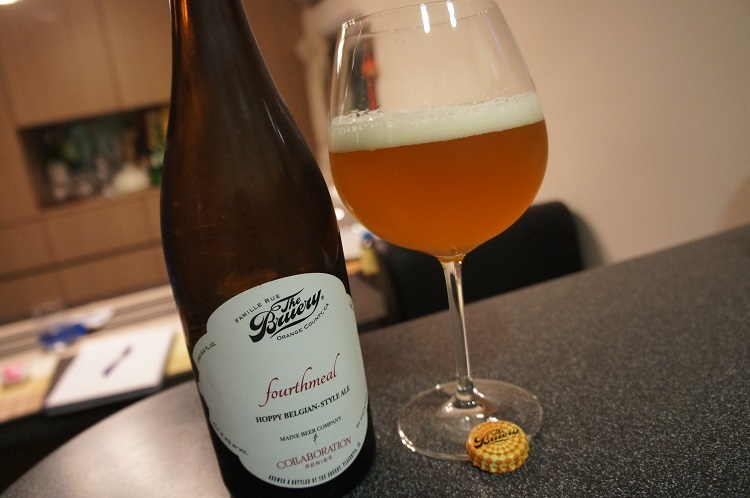 Aroma: Mandarin orange, pine, candied malt, grass and light grapefruit pith. Taste: Light citrusy candy orange, bready malt, pound cake, light bitter herby pine and grass with a light peppery finish. Mouthfeel: Crisp, dry, medium bodied with medium prickly carbonation. Overall: This was nice. Medium bodied but very light crisp easy drinking. Wish I could have tried this earlier for a fresher point of view.